! This is NOT a method of direct communication with THE GOOSEBERRY FLOWER & GIFT SHOP for purposes of ordering or rectifying problems. Flowers and vase were beautiful like the picture, arrived on time. Great service! This local business is tops! A dear friend from Australia sent us the sweetest remembrance With flowers. Gooseberry then put together the most beautiful, fresh and longest lasting bouquet I’ve ever had. It is simply gorgeous. Ive had many fresh arrangements from them and the quality of blooms, the arrangement style, helpfulness and fast delivery are things I always mention to friends. Awesome, fast delivery! Thank you!! Very easy website, very beautiful arrangements. Unfortunately I had a second family funeral in a month. I live out of state and for a second time I used the flower services. I easily ordered online and paid for flowers to be delivered to funeral. After they were delivered I received an email saying flowers were delivered. Very easy and convenient. Will use them again! I ordered a birthday fruit basket for my sister starting in Indiana. She said it was just lovely!!! I incorrectly ordered online last minute Sunday night for a funeral. The next day they fixed my order without me calling and by the time I called it was done. I was so pleased because I had to work and couldn’t call earlier. They did a great job! My daughter was married on 4/20/18; Emily and I took a picture to them of what she wanted her Wedding bouquet and throw-a-way to look like. Gooseberry did an outstanding job; and delivered the flowers to the Church the day of the wedding. PERFECT!!! The flowers were even more beautiful than the online photo. They were gorgeous and the birthday girl loved them. I ordered online and the flowers were delivered early the next day and they were even more beautiful than the picture. I was impressed and the birthday girl loved them. I ordered the spring flowers with the bird nest and butterflies. It was absolutely gorgeous! Beautiful flowers and very friendly service. Great people to deal with always deliver just what is ordered. Beautiful arrangement and still looks nice after a week. I was able to pick out what i wanted and have it sent all in the same day! That doesn't happen often. I was very pleased with the arrangement and it took all of 5 minutes to pick out order and pay! Thanks! Very happy with your service, actually just had a friendly suggestion. When you shop online, it would be awesome if you could show the picture of the arrangement to match the price. Just an Idea I had while shopping! Keep up the good work. I ordered an arrangement which showed a picture and I was lucky enough to get a picture back from the recipient upon delivery. I am very happy to say that what I ordered was exactly what was delivered. Ordering online can be very frustrating when it comes to flowers. Too many times I have ordered something and paid quite well only to find out that I got a very "poor representation" for the money spent. This however was NOT the case at Gooseberry. I cannot say enough great things about this experience. Thank you for giving me "faith" in ordering flowers online again!!! I needed an arrangement for a funeral and first looked at all the major online florist sites. Not finding what I truly felt was right I then called the Gooseberry Flower Shop and spoke with Kathy. I was uneasy about putting my trust in a small town florist, but with her suggestions to guide me along we together agreed on what it should be. She created the perfect arrangement with just the elements I wanted. Thank you Kathy for your compassion, for guiding me through that process when I was completely lost, and for delivering the perfect arrangement at a time that meant so much. The flowers were beautiful and delivered quickly. Thank you, thank you! I ordered the "junk food" basket and it turned out beautifully! Much better than I was expecting and delivered on time. All around good experience. Got it delivered in a timely manner as a late order, and it was a nice arrangement. Ordered a boutonnière and a corsage for prom and they had it ready for me that day and I could pick it up whenever. They both were stunning, and definitely will go back! Thanks Tom and Kathy! The arrangement was beautiful. I was concerned about it not arriving for the visitation as it was on a Sunday. I was happy to see that my order was there and very beautiful. I believe the spray for the casket was provided from Goosberry also. And it was BEAUTIFUL! Great work! Thank you!!!!! The flowers were beautiful and lasted for several weeks. great service & beautiful flowers, thank you for helping make my Mom's birthday special. The family liked the arrangement very much. I did see it at the visitation, looked just like the picture online. Flowers were fresh and artfully arranged. Thank you. The flowers were beautiful. It was very convenient to be able to order online. I appreciated the delivery confirmation. The delivery was the same day and I liked getting a confirmation email that they were delivered. The arrangement was beautiful! The pink roses are large buds that have just begun to open; which is just perfect because that means they will last longer. The greenery was light and airy and the ribbon on the vase hand tied! Best of all was the super quick delivery! 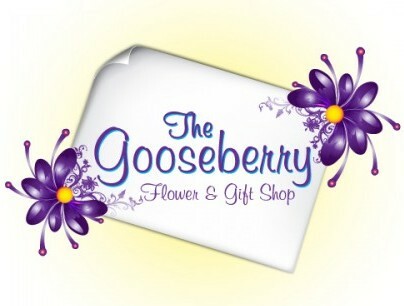 Have always had a very good experience with THE GOOSEBERRY FLOWER & GIFT SHOP.... My lovely wife has always had a big smile after I have sent her flowers. That is worth 5 Stars to me! I received the beautiful birthday arrangement and was impressed with the great idea of the leaf submersed in the vase. At first I thought it was the way the vase was painted but then realized it was a leaf. How creative!!!! Thanks for making my 64th birthday so memorable!!!! The flowers we ordered arrived at my parent's home promptly. I was informed that they were also beautiful. I like that you have a website to order from instead of going through the "other" websites. Beautiful stone; promptly delivered; Thank you very much! It was the prettiest arrangement there! Once again, the gooseberry did a wonderful job on. The flowers were absolutely beautiful, received the bouquet on Thursday and they're just a beautiful today. All flowers and no fillers! Love love the gooseberry! The bouquet was perfect! It matched the picture perfectly and my niece loved it. I ordered flowers in the morning and they were delivered that afternoon. I appreciated the confirmation email notifying me that delivery had been completed. I order flowers and gift basket arrangements quite often from the Gooseberry and have never been disappointed! Delivery has always been on time and just what I expected! We loved our anniversary bouquet. The arrangement was fresh, full and beautiful. Very, very pleased with the service and the arrangement!!!! So, so beautiful! I liked the choices online where you could pick different price versions of a bouquet. Also loved the discount if purchased online. Great! As always, everything was great!! Great selection and easy to order online. Thank you for the email confirmation that the flowers were delivered! Great customer service! I was very pleased with the service and promptness of the delivery!! My mother in law loved the flowers! My step-mom received the "Delicate Emotions" flower arrangement for Mother's Day and she said "They were absolutely gorgeous!" That's an A+ in my book! Thanks! I have used the Gooseberry for two recent funerals, the arrangements were beautiful and reasonably priced. Recently, I placed an order for my mother's birthday. Not only did the flowers arrive on time, she was THRILLED with how beautiful they were! It's a reassuring feeling knowing I have a florist whom I can trust to deliver quality arrangements to family and friends. I was going to be out of the Country and wanted to send my Mother flowers. I ordered a custom arrangement telling Tom and Kathy that her favorite color was red and leaving the rest up to them. Not only did the arrangement far exceed any expectations I may of had. It also lasted over two weeks so I was able to see it too. Gooseberry did an exceptional job, as always! I've received several compliments on the mixture of flowers. There are time when roses don't open up nicely but the two yellow and the miniture roses are beautiful!!! Have a good weeend. It was easy to order and the delivery was perfect. Thank you. I think it is wonderful that i can order online makes my job as a husband easier lol.Service was wonderful and i made a call to see about a early delivery and it was not a problem they treated me very well thank you for your service . Flower arrangement was beautiful! Would order myself for a gift for someone else. Thanks!! The flowers were absolutely beautiful and have held up very well. They were beautifully arranged as well. I love them and have enjoyed them all week. I have always loved your arrangements. They always have that special something added to them. You do a "GREAT" job. The arrangement that you made was lovely. I received a card from my friend saying that her mother would have loved them Thank you. It was great to receive such excellent service and quality floral arrangements. When you order "blindly" online, you never know. Thank you for fulfilling our order so well. Both arrangements were beautiful! The flowers are beautiful! They arrived in good time, my mother loved them and the arrangement was perfect! Our friend was very pleased! Although I did not see the arrangement, my understanding is that they looked just like the one in the photo on your website. The email letting me know they had been delivered was nice. Thanks for excellent service! I love the fact that I receive an email confirming the delivery! The arrangments are beautiful and the convience of ordering locally online is wonderful! Anytime I have sent flowers using Gooseberry, my friends tell me the arrangements are amazing. I was very pleased with the flowers. They were exactly as represented in the photo on your website. Thanks for excellent service! The flower arrangement is beautiful. The smell was very nice. I loved them! Very nice flower flower arrangement and customer service. Flowers were delivered on time and exactly as ordered. Thank you! We are new to the Batesville area but have received several arrangements from The Gooseberry. The flowers are fresh and long-lasting and the arrangements are absolutely beautiful. We are loyal customers! The flowers were breathtaking ! I have never had more beautiful flowers delivered to me. The flowers were delivered when asked, and they were very fresh and fragrant. The flower mix was very nice and displayed well. Thank you! Received a great compliment from the recipient, so I am very pleased with my selection from you. The recipient was very pleased! I appreciated the email regarding the delivery of the flowers to let me know it had been completed. I am very picky about the flower arrangements I buy, having studied floral design, but I am always pleased with the work you do. Keep it up! I didn't attend the funeral but I did appreciate the email after the order was filled. That made me feel better in my choice of florists in a town that I am unfamiliar with. Excellent service, they even called because I had forgotten to enter information for a card. Very, very pleased with the service and the arrangement!!!! My husband purchased flowers for me on Valentine's Day. I have never had roses look as pretty as those for more than a day maybe two. The roses from Gooseberry lasted over a week. Further, we recently had an arrangement sent to a funeral. The following day we recieved a heartfelt note from the son who just lost his father. He wrote that he took his "mother around to all of the flowers that had been sent so they could read the cards to her. When we came to the beautiful arrangement that you sent, a gentle smile came to her face. We had not seen her smile for a few weeks and for that I am very grateful." You never really know how much you touch someone with a simple sending of flowers and Gooseberry ALWAYS takes extra special care. We've used them for years and always have a wonderful experience.